At first Joel atta­ched the came­ra to the z axis and the sli­de res­ted on the build plat­form, but it soon beca­me cle­ar that it would be much bet­ter to have the sam­ple remain still and the came­ra move ins­te­ad. Inver­ting the posi­ti­ons meant atta­ching the sli­de to the bot­tom of the z axis plat­form in order to pre­vent the came­ra lens from bum­ping against it. This setup also allowed him to use the z crank as a focus mecha­nism. So we were happy with the phy­si­cal setup whi­ch, in con­junc­ti­on with ReplicatorG’s con­trol panel, pro­ved very use­ful for fin­ding and trac­king micro­or­ga­nisms within the sam­ple. But we also wan­ted to try an auto­ma­ted scan. So the next step was to gene­ra­te a path for the came­ra. We made a bun­ch of expe­ri­ments with MakerBot’s Fros­tru­der Tool Swe­et, but even­tu­ally an stl + skein­for­ge, with a fee­dra­te of 12 mm/m, tur­ned out to be the best solu­ti­on. Finally, the micros­co­pe came­ra (whi­ch is a che­ap web­cam with a macro lens that Joel flip­ped upsi­de down) was con­nec­ted to his Pro­ces­sing script that records both video and stills from the inco­ming video feed. Video of fist auto­ma­ted scan (sam­ple is moss from a well). 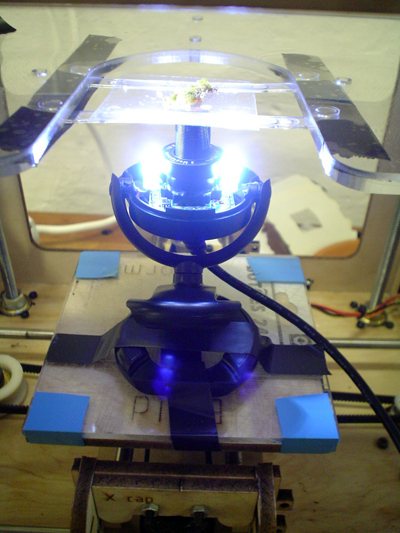 — Record micros­co­pic ima­ges of each and every area of a sam­ple: just feed the maker­bot a grid-like design, set the pro­ces­sing script to take a pho­to of each qua­drant, go enjoy the gre­at out­do­ors, and when you return to the lab you’ll have all the ima­ges wai­ting for you on your hard dri­ve. — Auto­ma­ti­cally cap­tu­re ima­ges of live bac­te­ria: we’ll try to do this by having the pro­ces­sing script track cer­tain types of moti­on and cap­tu­re stills when it’s detec­ted. — Some dan­cers here at the AZ resi­dency also beca­me very inte­res­ted in using it as live video feed for per­for­man­ce.